Since January 2007 the post I scribbled in 2005 on Sylvac bunnies has been seen by 906 people across 1237 visits to the wendy house. Only 5 other scribbles have more visitors. Unlike the top 5 scribbles all the traffic for the Sylvac Bunny scribble comes from search engines rather than referal links. It’s popular because of its content alone rather than the popularity of the people that link to it. Sometimes the visitors leave comments asking me questions that I am unable to answer. Its wonderful to see other visitors then drop by and answer those questions. People send me photographs of their bunnies, and one person sent me photographs of his 2 Doggies. This Turquoise Dog …say 7 1/4″ or 7 1/2″ High is a puzzle and i have not been able to pin down …if Price Company or Sylvac or who made it. this would be fun to find out! Here are pictures of Gerald’s doggies, click on the photograph to see a larger version hosted on flickr. Looking at the Denman’s auction site, where verified Sylvac doggies are photographed for sale, we can see that Sylvac produced a broad range of designs and colours. 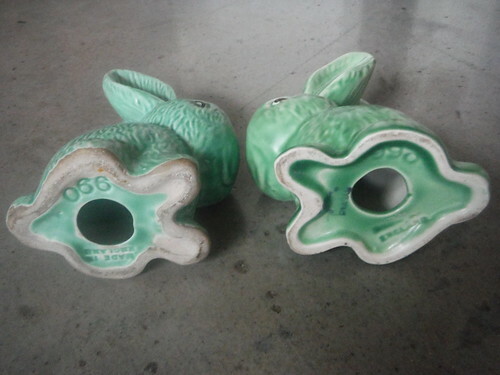 his Turquoise Dog …say 7 1/4″ or 7 1/2″ High is a puzzle and i have not been able to pin down …if Price Company or Sylvac or who made it. this would be fun to find out. 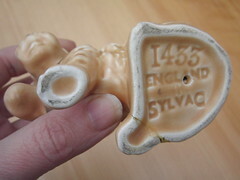 My one Sylvac doggie is approximately the same size with a couple of damaged legs, a less glossy glaze and very clear model number and manfuacturers stamp on the base. On the day I looked at Denman’s auction site my doggie was on the lists but Gerald’s model was not… …what does it mean? Can you help us? A family of biddies and the bunnies (SylvaC). 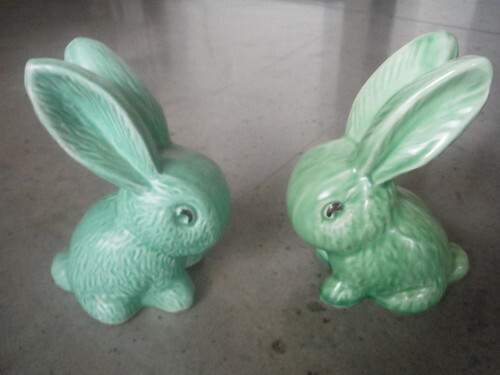 I really must put a cap on the bunny habit, before I am lured into the church of the cosmic bunny, or the odd hare that creeps in for a quick box while gazing at the moon.